Carb stands for carbohydrate. In a low carb diet, you will avoid eating higher carbohydrate level food and will focus on lower carbohydrate and higher fat-containing foods. In Low carb diet, you lose weight with the help of healthy fats and protein. Fat burning increases drastically by not taking sugar and starch. Avoiding sugar and starch stabilize your blood sugar level and bring many more health benefits and in this way, you lose weight. You avoid high sugar containing foods like chocolates, soft drinks, and cakes you also avoid starch-containing foods like rice, pasta, and bread. This diet is very helpful for type 2 and 1 diabetes. Because this diet not only loses your weight but also regulate blood sugar levels in the diabetic range. 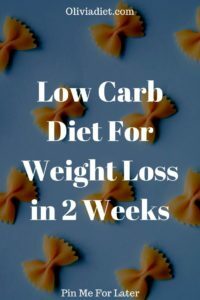 These 5 ways are the science-backed ways of increasing the effectiveness of a low carb diet and also it is keeping it in the beneficial range. One of the strong reasons we carry out a low carb diet because it stabilizes the blood sugar level. But there are times in which if we eat carbohydrates it won’t disturb the sugar levels. The perfect timing is before, after and during the exercise. So, it is highly recommended that you should take little carbohydrate before, after or during the exercise. Put some people find this as an excuse to eat a lot of carbohydrates. If there is a lot of fat on your waistline and belly that you can grab by your hand than you should carry a low carb diet. If you are having 7-8% of fat and you are a male or female teen than carrying out the low carb diet will be a big hustle for you. If your body fat is 30% then you should carry out low carb diet and limit the carbohydrate intake. If your body fat is 6% then you should not carry out low carb diet and even it is advised for you to eat bowl carbs containing food like rice. Processed food contains an unwanted amount of sugar, fats, and carbohydrates that increase the inflammation. Higher inflammation makes it very difficult for you to lose that weight. Stay away from this food. Instead, go and make healthy fat your meal. Eat fresh fruits and veggies that contain anti-inflammatory properties to help you in losing your weight. Keep your body hydrated all the time not only in this diet alone. In a low carb diet, enough water intakes reduce your cravings for carbs at the start of the diet when you have recently started avoiding carbohydrates. Additionally, water is very necessary for the beta-oxidation process to mean it increases the rate of using fat as energy for your body. So it is highly recommended to take a lot of water. When you start low carb diet you suddenly stop consuming fresh vegetables, fruits, and grains that decreases the levels of fiber and which bring inadequacy in anti-oxidants, vitamin c, potassium and phytonutrient intake. You should eat leafy greens and many vegetables that are un-starchy. So, you should eat non-starch containing vegetables in low carb diet to fulfill your fiber needs. These are the few mistakes to avoid because this will do completely opposite to your body in low carb diet. Mean if don’t avoid these mistakes you will end up more obese than losing weight. You are required to avoid carbohydrate in the diet that’s why you will go to the food that contains more fat and protein. Avoid overeating of meat and cheese for this purpose to take more fat and protein instead you will end up gaining more fat because these foods contain a lot of calories. Be aware of all those packaged foods claiming that it is low carb foods. Like meal replacement bars, low-carb ice-cream and many others labeled as low carb foods. These low-carb and sugar-free foods usually contain Maltitol. Maltitol is bad as sugar in many ways and it disturbs your blood sugar level. If this mistake disturbs your sugar level than low carb diet is good for which thing? Many people don’t think that doing exercise in needed when following a low carb diet. This is totally wrong. You should do exercise. Exercise helps in losing and maintaining your weight. It also keeps you active mentally and physically. Eating healthy fat is very necessary for you to carry this diet successfully. Initially, you will see the drop in your fat because your body will use it for energy by actually eating it. But after that, your weight loss drop will considerably slow down because you are not eating healthy fats. Also, avoiding healthy fats will make you hungry and being hungry is very dangerous for any diet to carry out. So, try to eat avocado, olive oils and much other healthy fats containing foods. 1. Promotes Low sugar levels of your blood and needs of insulin. 5. It reduces your body inflammation. This is very good for anti-aging and weight loss. Let’s keep it short and sweet. Follow all the instruction above throughout the 2 weeks. 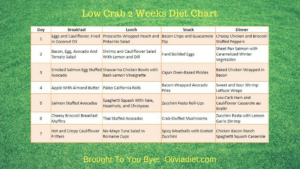 Below is the Low carb diet chart for you. Right click on the image and open it in the new window. Download it, share it, and email it to somebody. It’s free for you. Dietitians strictly recommend that your daily intake of carb in your calories makes up to 45 to 65 percent. For example, if you eat 2000 calorie per day than there must be 225 to 325 grams of carbs. But here we are following a low carb diet for weight loss than it is recommended for you to take 50 to 150 grams of carbs per 2000. Low carb diet is not only good for weight loss but also for blood sugar level, insulin, brain and overall health. Keep the information of this article in your mind when starting low carb diet. You will succeed for sure.